Our recent clients have a beautiful home in North Richland Hills that they’ve lived in for several years. The house was in good condition, but the clients knew it was past due for an update. 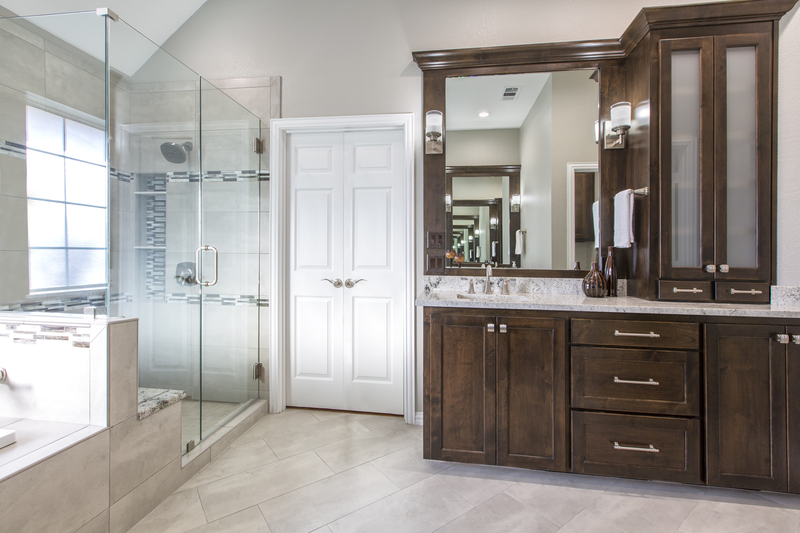 One of the rooms at the top of their list to remodel was the master bathroom. The original bathroom was very dated, including pastel pink wallpaper, builder-grade cabinets, poor lighting, and limited storage space. With hopes of redesigning the room for improved style and functionality, they contacted us to address their needs. Our knowledgeable team of designers met with them in their home, discussed the issues and possible solutions, and provided the clients with a clear course of action to get the project done. 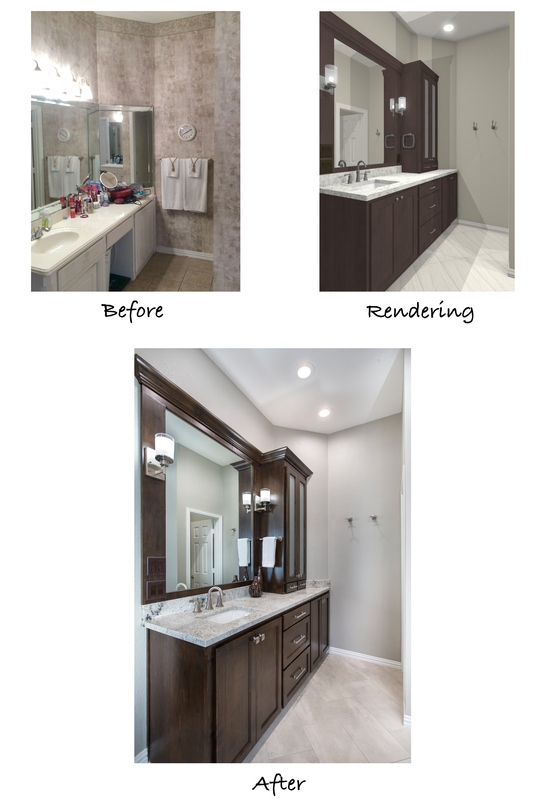 Once they made the decision to move forward with a custom design package, the clients provided us with an inspiration photo of what they had in mind for their remodeled bathroom. Our designers took photos and measurements of the existing room and began creating the new floor plans, 3-D renderings, Scope of Work document, and Budget Items list. Our clients really appreciated the level of detail that was shown in the designs and documentation. It’s always important to have a clear understanding of your project and know exactly what is included before proceeding with any home remodeling project! You can see in the before and after floor plans that due to the size and location of this bathroom, there wasn’t a lot that could be changed layout-wise. We opted to keep the plumbing lines where they were, so instead of reconfiguring the room completely, we updated the existing layout. 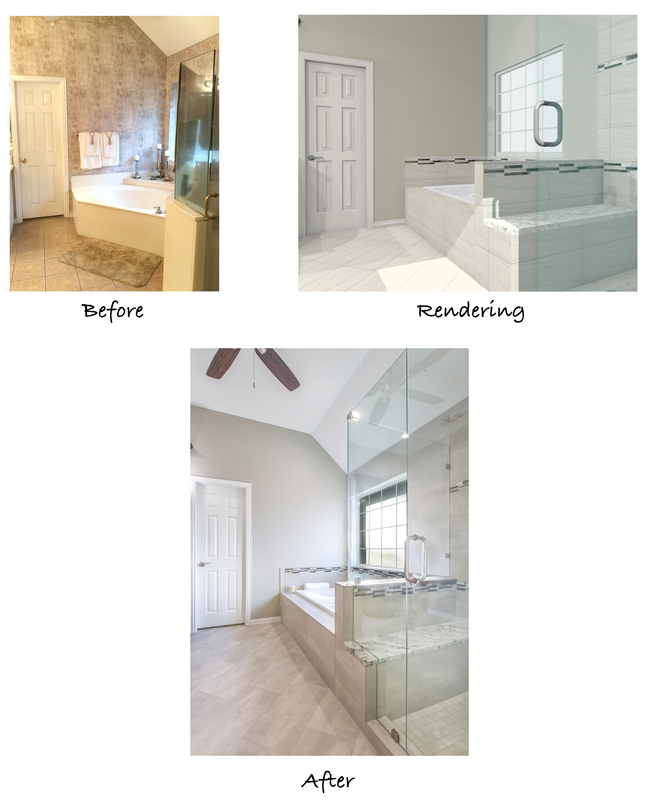 The one structural change we did make was to remove the corner tub and angled shower and replace them with a 60” soaker tub and frameless glass shower. Doing this required taking in the shower 1-foot, allowing for a more streamlined look and functional tub that the clients would actually use! The His & Hers vanities and the toilet room remained in their initial locations, with modifications to the cabinets for improved storage space. Some of the aesthetic changes of this renovation involved removing the wallpaper and painting the walls a soft, neutral shade of gray. This change alone made a world of difference! The refreshed walls provided a beautiful backdrop against the rich, dark stain of the new cabinets and white granite counters. For the ‘Hers’ vanity, we filled in the sit-down vanity area with additional storage drawers, complete with electrical outlets inside – perfect for the hairdryer and styling tools. 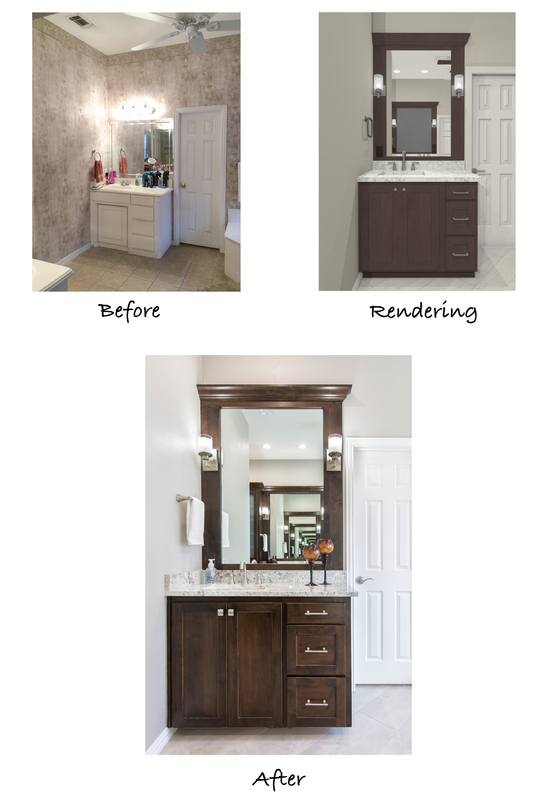 At the far end of the vanity, we installed a glass-front cabinet tower for more added storage. Reducing the size of the mirror and installing a matching frame allowed ample space for decorative sconces on each end. The “His” vanity was also redesigned with sleek new cabinetry, deep drawers, and a taller framed mirror. Matching sconces, a stainless-steel towel rack, and satin nickel cabinet hardware create a consistent, formal aesthetic. The large corner tub and angled shower created a choppy feel and made the room feel smaller. Aligning the redesigned shower and the new drop-in tub flush against the wall makes for a much more uniform look. The beautiful design details of this space include frameless glass encasing the shower, a custom shower bench to match the granite vanity counter tops, and glass mosaic accent tiles. The diagonal offset lay of the 12×24 flooring tiles reduces the appearance of the grout lines and makes the room appear larger. Strategically placed LED can lights, along with fresh white paint on the ceiling, really brightens the room! You would be surprised at what an impact new lighting can make. The natural light from the large window behind the tub is also magnified, since the walls and flooring are now a lighter, neutral color. The remodeled room feels light, bright, and calming – like a soothing spa! The clients are extremely happy with their serene new bathroom. 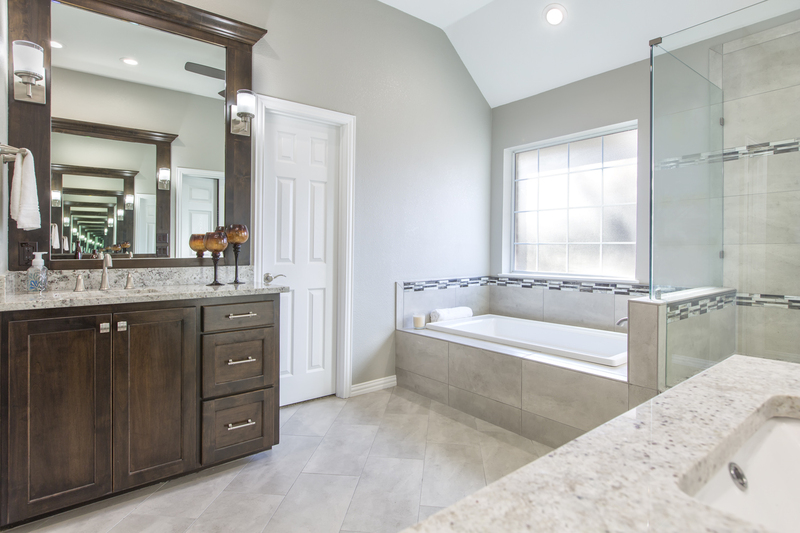 If your master bathroom is overdue for a refresh or is lacking desired functionality, our team would be happy to bring your remodeling dreams to life! Contact us today for more information!